It’s been over 10 years now that some influential players in the financial services industry bundled their forces to stop the ever growing cost for IT integration. The Banking Industry Architecture Network was born. After 10 years of hard work of all members in our community we have packaged all the knowledge and insights in this book. At BIAN we believe that the Banking industry wastes over a billion dollars each year due to the complexity of our core technologies and integration approaches that only ignore the problem, if not add to the dilemma. This has become one of the primary reason Banks are not getting anticipated benefits from their digital transformations. We must rid ourselves of the anchor that is slowing us down which is proprietary core banking solutions that are today’s legacy technologies only to be tomorrows if we do not change. This book covers all aspects of Architecture for the financial services industry. It should support all involved to help their organizations to enter a truly digital world. 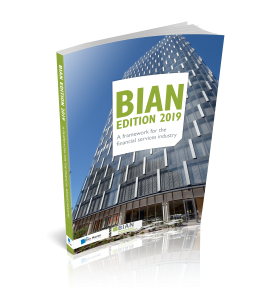 Besides our original Service Oriented view, the authors also included our latest insight on Enterprise Architecture and give you guidance in the fast evolving API arena. Open Banking is an emerging and high-profile area in financial services. There is a ‘market forces’ definition of Open Banking. It refers to the use of Open APIs that enable third-party Developers to build applications and services around banks. There is also a ‘regulatory’ definition of Open Banking, focused on greater transparency and choices for bank account holders which is being enforced by regulators. Some commentators suggest that Open Banking could cure many ills in modern banking. The emerging Open Banking environment is often described as an Ecosystem. Healthy ecosystems have viable populations of various interacting species, ecosystem diversity, a constant evolutionary process and sufficient evolutionary potential. The potential interactions in an Open Banking Ecosystem interests many investors and entrepreneurs. Within existing banks, corporate strategists, technology specialists, business unit leaders and risk managers are also examining its impact on the landscape of financial services. As an Open Banking Ecosystem emerges, a central question must be the capability of existing banks to adapt and evolve into this new environment. Open Banking Strategy Formation examines the forces that are likely to influence the evolution of Open Banking at an industry level. The transition of the industry to Open Banking will come from a patchwork of deliberate and reactive changes by existing and emerging market participants. 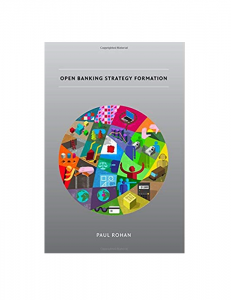 Open Banking Strategy Formation will help existing and new market participants to judge how and when their businesses can become part of the Open Banking Ecosystem.